Be it recharging your mobile phones, DTH cards or data cards, or paying your mobile phones bills, gas, electricity and other utility bills, FreeCharge brings rewards on everything. Every time you pay bills or buy a recharge with FreeCharge you get discount coupons for food, movie tickets, travel bookings, shopping online, gaming, almost for everything. To make it even more rewarding, Zingoy brings you all the best FreeCharge deals and discount coupons here on a single page. Also, when you pay your bills and buy recharge on FreeCharge using Zingoy, you also earn huge amounts of cashback on all your payments. So, keep paying and keep earning with Zingoy. The customer shall receive flat Rs.10 cashback, on the transaction value of Rs.30 in the form of Freecharge Gift Instrument within 72 (seventy two) hours from the date of transaction which can be redeemed on the Freecharge website or Freecharge application or any other merchant website wherein Freecharge Balance is acceptable, within 1095 days from the date of the credit and is non-transferable. Offer is valid five times per user. This Offer is valid from 19th Dec to 30th Apr 2019. This Offer applicable on the Jugnoo app. The entire invoice amount has to be settled using Freecharge Balance, partial payment through Freecharge Balance is not allowed. In case of order cancellation, refund by Freecharge Wallet will be processed within 7 to 10 working days. The customer shall receive 15% cashback, upto Rs.50, on the transaction value in the form of Freecharge Gift Instrument within 72 (seventy two) hours from the date of transaction which can be redeemed on the Freecharge website or Freecharge application or any other merchant website wherein Freecharge Balance is acceptable, within 1095 days from the date of the credit and is non-transferable. This offer applicable on the 1MG app and website. The offer is valid from 14th Sept 2018 till 30th Apr 2019. The Offer is valid only once per Freecharge Account/device/mobile number till 30th Apr 2019. The entire invoice amount has to be settled using Freecharge Balance, partial payment through Freecharge Balance is not allowed. In case of order cancellation, refund by Freecharge Wallet will be processed within 7 to 10 working days. The customer shall receive 25% cashback, upto Rs.75, on the transaction value in the form of Freecharge Gift Instrument within 72 (seventy two) hours from the date of transaction which can be redeemed on the Freecharge website or Freecharge application or any other merchant website wherein Freecharge Balance is acceptable, within 1095 days from the date of the credit and is non-transferable. This offer applicable on Swiggy app and website. This offer is applicable only on 1st transaction via freecharge on Swiggy. This offer is valid once per user. This Offer is valid from 18th Sept 2018 till 30th Apr 2019. The entire invoice amount has to be settled using Freecharge Balance, partial payment through Freecharge Balance is not allowed. In case of order cancellation, refund by Freecharge Wallet will be processed within 7 to 10 working days. The customer shall receive Rs.10 as cashback in the form of FreeCharge Gift Instrument within 72 hours from the date of the transaction, the same can be redeemed within 1095 days from the date of the credit and is non-transferable. The offer is valid on a minimum transaction of Rs.15. FC10 Promocode has to be applied to avail cashback offer. The customer can use the FreeCharge Gift Instrument received under this offer for subsequent transactions on FreeCharge. The offer is valid only once per FreeCharge Account/credit card/debit card/netbanking/device/FC balance/UPI transaction/mobile number till 30-April-19.. Not Valid for Add Cash & Bus booking transactions. Offer is not applicable on virtual/ prepaid/ temporary/international cards. If you have been planning on going cashless then you need to have access to Freecharge. It lets you make payment for your gas, electricity, landline bills, you can recharge your mobile, buy grocery, book your flights, recharge your DTH, shop and much more. Download the mobile app so that you can carry your digital wallet in your pocket wherever you go. Freecharge is a convenient way to pay your online electricity, postpaid and prepaid bills easily. With every recharge or bill payment on electricity or mobile bill, you get extra cashback on Freecharge with Zingoy. Get 100% cashback on your Jio mobile/Datacard recharge using coupons and promo code. Enjoy your latest movies by booking tickets through Freecharge and get exciting online offers with extra Zingoy cashback. Also, you can travel to your favorite destination and save more on your travel tickets with Freecharge offers additional cashback is available by using Zingoy Freecharge promo code. Freecharge makes you comfortable to pay the online gas bill, electricity bill, and water bill and also helps to save money but on Zingoy not only can save money on Freecharge but also get extra cashback from Zingoy. Order food from Freecharge and get exciting offers & deals. From your mobile and DTH recharge to grocery shopping, everything comes under Freecharge cashback offers, which means you can earn money while making payment. But the best way to make the most out of cashback offers is to avail these using Zingoy which gives you some more cashback on using Freecharge promo codes and offers via Zingoy. Zingoy makes these special offers even more lucrative, which means now you can earn extra amount on your exclusive cashback offers if you avail that using links given on this page. If you don’t find the particular Freecharge offer/ coupon here, you just have to create your own Zingoy shopping link of the Freecharge store page using the ‘Joy of Sharing’ pane on top of this page. 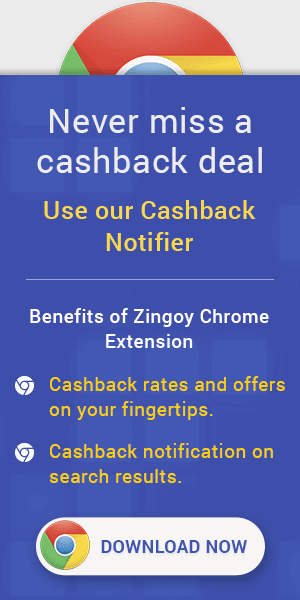 Zingoy also has a Chrome extension which reminds you of availing cashback offers from Zingoy every time you visit Freecharge or any other shopping site.